Compare the low pressure, medium pressure and high pressure nozzles from Greenleaf and find the one right for your application. 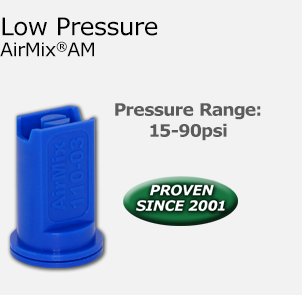 Reduce drift potential by confirming the correct nozzle size based on your particular flow rate. Find out where each Greenleaf Nozzle performs best. There is one for your application based on multiple conditions. Turbodrop nozzles use a Venturi system to draw in air. This makes droplets less likely to drift. It’s the proven method trusted by professionals. Full details on the various sizes of Greenleaf nozzles so you choose the right one for your specific conditions. Compare the different pressure nozzles from Greenleaf and how your chemical application can be greatly improved. In field plot work, weed scientist James Hanks saw a 90-95% reduction in drift with TurboDrop® spraying Roundup Ultra, with no loss of efficacy. 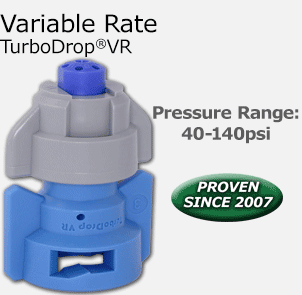 With TurboDrop®, the increase in small droplets is much more gradual. 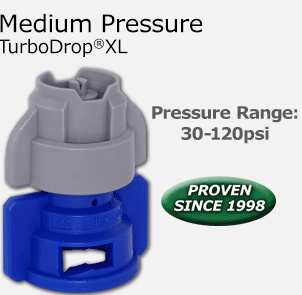 At 70psi TurboDrop® has fewer driftable fines than other nozzles have at 20psi. See how Greenleaf Technologies. Turbodrop nozzles stack up to our competitors in a real-world application test. Better coverage with reduced drift. It.s proven again and again how Turbodrop nozzles raise the bar in every category you demand. TurboDrop® allows spraying at higher speeds for more coverage with the use of less water, much less drift. As travel speeds increase, and GPA rates decrease, the difference between TurboDrop® and conventional nozzles is even more pronounced.